I believe this is safe to post since the 12 hour window was over long ago, although solutions have yet to go up. Taking the test this year was interesting since my printer’s color ink has gone haywire and I went entirely without grays or reds this year. On some puzzles that meant I had no gridlines whatsoever. For the test as a whole, 344 is my expected score. I haven’t talked with enough people to know what rank that will get. Here’s what happened on individual puzzles. Update: An email suggests I have 1st, with a score of 338. The decrease is due to a coordinate messup on the differences puzzle. I blame the gridlines not showing up on that one. Here’s instances of 13 (Looper) and 14 (Tight-Fit TomTom). I suspect the Looper here is easier than 20 points, and the TomTom is probably about the right level. I confess I didn’t check these extremely thoroughly since I’m moving on to working on other types. I made two attempts to construct Bombardoku, and both broke at the end. So I guess I’m the only that got practice out of that. Sorry. Looper: Draw a single closed loop connecting all of the blank squares horizontally or vertically. 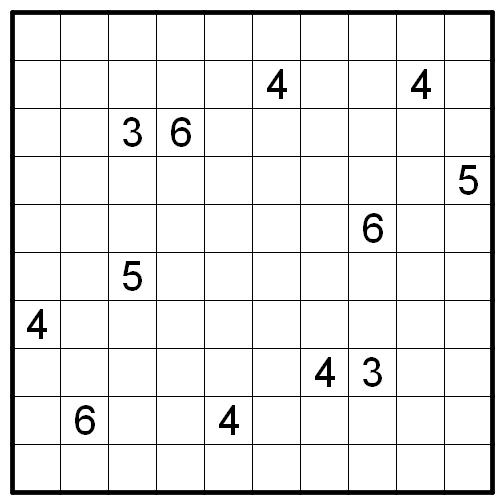 Each number in the grid indicates the number of right-angle turns in its neighboring squares (including diagonally). Tight-fit TomTom: Place the digits 1 through 8 into the empty squares (one per full square, two per split shaded square) so that each digit appears exactly once in each of the six rows and six columns. Digits can repeat within an outlined region. Additionally, for each outlined region, the given number is the result of the given operator applied successively to all values in the region, starting with the largest value for subtraction and division. 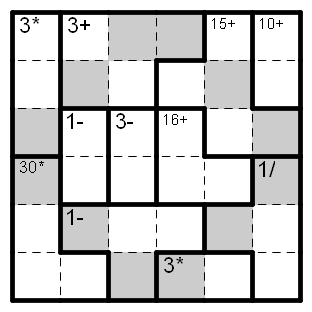 Squares containing a slash (shaded instead in the preview puzzle below) will have the corresponding fractional value. Before I say anything else about the post title, I should give a few words on my absence. In short, the outcome of the Mystery Hunt I contributed to left me very drained on puzzles for months, and I think the first time I’ve constructed anything since then was May. I think I’m finally back on my feet though. Future puzzles from me will soon be appearing at Thomas Snyder’s Grandmaster Puzzles blog. You won’t be seeing much posted at this URL anymore; probably just the occasional post like this one. Anyways, the 2013 USPC instructions are now online. Here’s a collection of practice material on the various types. Thomas Snyder posted tips for a lot of the earlier types in a series on common USPC types; I’ll be referring to that link a few times.